Courtney Crabill earned her Master of Science in Occupational Therapy from the University of North Dakota. Courtney has experience working in the childcare setting, inpatient rehab and in a psychiatric unit. 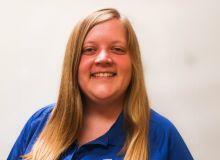 She also has experience as a peer mentor for individuals with Autism Spectrum Disorder. Courtney is licensed to practice in North Dakota and Minnesota. Courtney's areas of interest include Trama-informed Care used in occupational therapy, sensory integration, mental health, and working with families. She completed her thesis on Utilizing Trauma-Informed Care to Guide Occupational Therapy Interventions for Children in Foster Care. She is NBCOT certified and CPR/AED certified.